We think it’s hilarious how babies sometimes look like old geezers – so we created this shawl-collared grandpa sweater for your grouchy little old man! Suit him or her up and no matter how grumpy, your child will be stylish. And YES, despite reasonable common-sense notions, babies DO require pockets to store their tiny little pipes, and patches to prevent them from wearing holes through the elbows of their cardigans after years of use! We are on the home stretch, finally! The adorable Gramps Cardigan is very close to complete. If you are tired of reading about it, simply slap on some buttons and take your little grouchy old man out to the park. But if, like me, you believe it’s the details which really make a project, lets trudge onward together and we will complete this masterpiece together, tiny unnecessary elbow patches and all! Do you have a hard time finishing projects? Many people do, and I myself am no exception! Well the great thing about this project is that there is VERY LITTLE seaming involved. I enjoy this because I do not find seaming as relaxing as knitting, so I tend to avoid it. Luckily, I find picking up stitches magically delicious, so I employ this technique wherever possible to avoid seaming. This tutorial is part 3 of a 6-part tutorial covering sweater knitting techniques for the Gramps cardigan. To view the other parts of the tutorial click on the links below. 1/6 An Introduction: to start at the beginning look here! 2/6 Beginning your Sweater: Yarn and needle selection, knitting a gauge swatch, Understanding knitting pattern schematics. 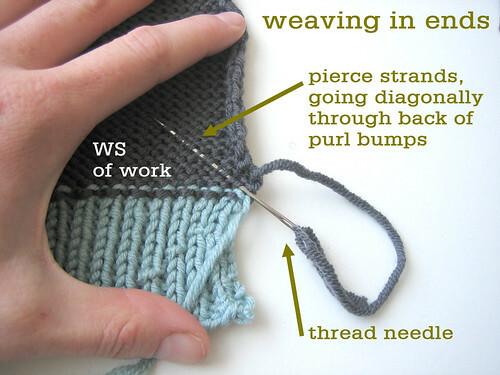 Picking up stitches in the middle of the work and weaving in ends focus of today’s tutorial. The last two finishing touches that will be added to the Gramps cardigan are the knit-on patch pockets, and the tiny elbow patches. Using larger needles and MC, starting 5 rows above ribbing and 5 sts from button band, pick up and knit 17 sts with RS facing. To pick up stitches on the right side of the work, hold both YARN and NEEDLE on the RS of the work. Insert the needle into the work, under one of the bars between two stitches, from the RS to the WS, then back to the WS. Next wrap the yarn around, then use the needle to pull the loop through the work, creating a loop at the front of the work. Continue working to the left in this manner, picking up a new stitch for every stitch of the work, in a straight line, until the required number are picked up. Turn the work, to work back (purling) to the start of the row where you began picking up. You can see a row of bumps which will be at the inside of the pocket. 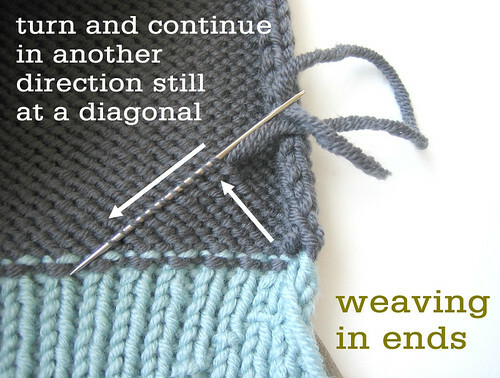 Continue to knit back and forth in rows as described in the pattern. Once the pocket is bound off, you sew down the sides of the pocket; I suggest using the mattress stitch, which is quite tidy and effective. Knitty.com has a good tutorial on this technique here. Voila! A little pocket. Make another the same, then move on to the elbow patches. The elbow patches are very easy to make. Simply knit them following pattern instructions, making two the same. If you leave a long yarn tail at the start or the end of the work, you can use this to sew the patch to the elbow. Weaving in ends is not the most fun part of a knitting project. But you are 97% of the way through, so grin and bear it. Pull out your needles and put on some cheesy TV if that helps sooth the pain. What kind of needle do you use? For grafting (kitchener stitch) and seaming (mattress stitch, etc.) 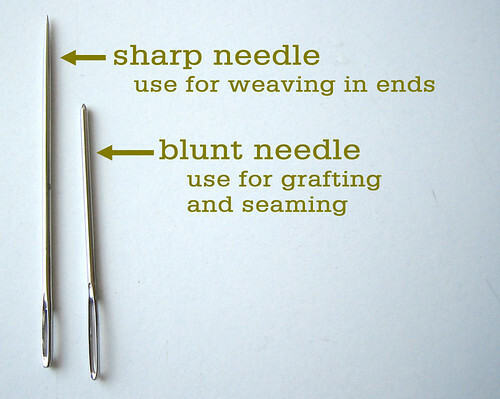 you want to use a blunt needle, so that the needle does not pierce through the yarn of the work, but instead slips between and around stitches. For weaving in ends, however, you should use a sharp needle, so that you can pierce the stitches, creating greater friction to hold the yarn end in place. Thread the sharp needle, and on the inside / wrong side (WS) of the work, begin to weave in, using the needle to pierce through the purl bumps of the fabric, working at a diagonal, so that the yarn end doesn’t impede the natural stretch of the knitted fabric. After awhile turn, and work in another direction, still at a diagonal relative to the knitted fabric. Once you have worked 2-3″ of yarn end into the back of the fabric, simply snip the remainder off close to the fabric. It should remain hidden and secure. Once the ends are woven in, and you have sewn on buttons in locations that correspond to the buttonholes, the pattern suggests that you block the sweater. 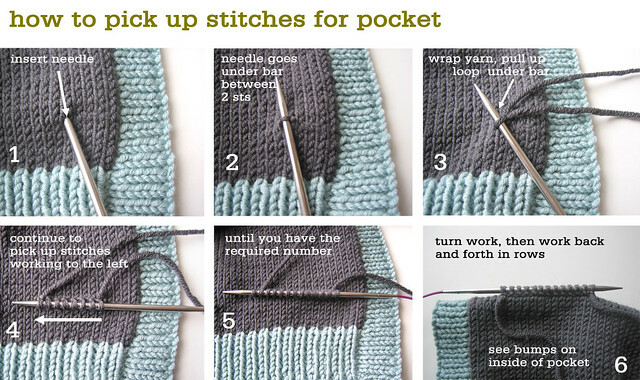 Many knitters skip this step but we say DON’T! Blocking makes your beautiful work of art shine, you have put so much time into it, why skip the last step? Blocking is not a lot of bother, and it always makes a knitted project look better and more finished. 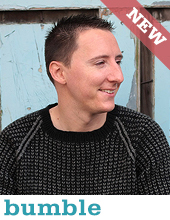 I have covered wet blocking in a sweater blocking tutorial here. Well now the sweater is complete! 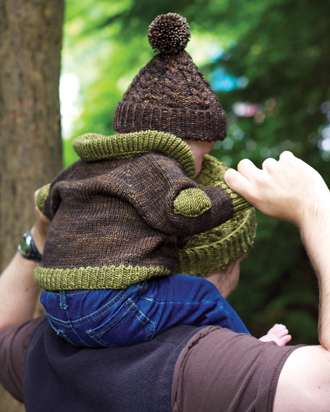 If you have followed along and knit the Gramps cardigan with me, you now have a beautiful little item to give as a gift or keep for your own grouchy little creature. Did you enjoy this tutorial? I hope that it was helpful and gave you the confidence to learn new techniques. With the skills you learned in this project you are now well-equipped to tackle most seamless sweater patterns! Is there anything I covered that is unclear? Did I miss any important points? Please let me know what you think of these tutorials, and make suggestions for other tutorial topics by posting comments, or contact me directly. This material is also intended to be useful to those who teach knitting. If you are a shop owner who runs knitting classes, and would like to use this tutorial for instruction, you are welcome to do so. Tin Can Knits wholesales books and single leaflet patterns to knitting shops in Canada, the USA and the UK, if you are interested in carrying our products, please contact us. Wanna hear about these tutorials as they are released? Get our excellent emails! Do you have knitting friends who could use this tutorial? 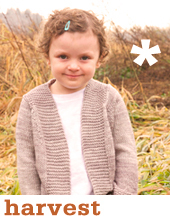 Share this post, or let them know about the great free patterns they could try from The Simple Collection. And join in the conversation on Facebook, Instagram, Twitter, Pinterest and Ravelry! 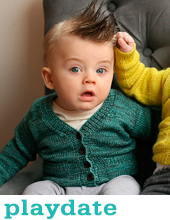 How can I have pattern of this Gramps baby cardigan? this is awesome thank you….. When you tell us to pick up the stitches for the pocket you say to go from RS to WS then back to WS? I couldn’t quite figure that out if it is not a typo can you do a more in-depth post on it? What a treat for sore eyes – the idea, the patterns layout, the detail – It left every question answered… Thank you sooooo much! thank you for such fantastic help!!!! What a great tutorial. I think this sweater is so cute! I love it and smile eveytime I read your updates on it.